A bit of a puzzle, this one, but bear with us. We started with the dictionary: ‘Lustrum’ = a ceremonial purification of the entire ancient Roman population after the census every five years, OR (thank heavens) = a period of five years. Yes, yes, the two dates do not encompass five years, we spotted that. The reference to Rotterdam prompted us to request the assistance of Igor Foerier, the Flemish-speaking Belgian who built our first website and maintained it for many years. 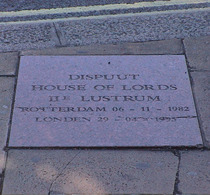 And he found Lords Gala where reference is actually made to the installation of this granite stone and 'House of Lords' no longer functioning, where there was even a picture of it. So, with Igor’s help, we have deduced that there is quite a strong streak of Anglophilia in the Dutch/Flemish flat lands (they like our mountains). In Holland, where Lords Gala and House of Lords are based, it seems to be the thing to theme social groups (mainly male students if the photos are anything to go by) around the House of Lords. They dress up as toffs and celebrate (i.e. Drink). One of these groups, or perhaps the whole movement, we’re not sure, was founded on 6 November 1982 in Rotterdam and their second 5-yearly reunion took place in London, on 29 April 1993, over 10 years later (they are drunken students remember). Also, it looks likely that they are actually debating societies. Igor plunged into the official Dutch dictionary (Van Dale) where ‘Dispuut’ is given two meaning: ‘combat with words’ (close to the English ‘dispute’) and ‘a student community, or a part of’. The dictionary goes on to link the two meanings together to come up with ‘debating society’, of which the House of Lords could claim to be a well-known British example. 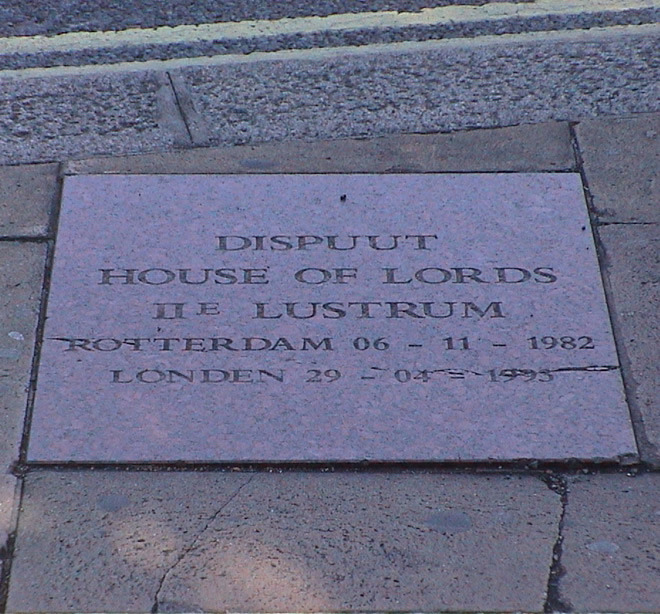 What remains a puzzle is how a load of drunken Dutch students managed to lay a huge lump of granite into the pavement, in spitting distance of the Houses of Parliament! 2017: Following input via Facebook it seems Viscount Craigavon (for whom Holland is given as a "focus") may have been involved in the laying of this stone. We've written to him for confirmation but no response so far. We'd guess that this plaque is based on a letter that Jane wrote from here. Stanley was aged 14 when he laid this stone.